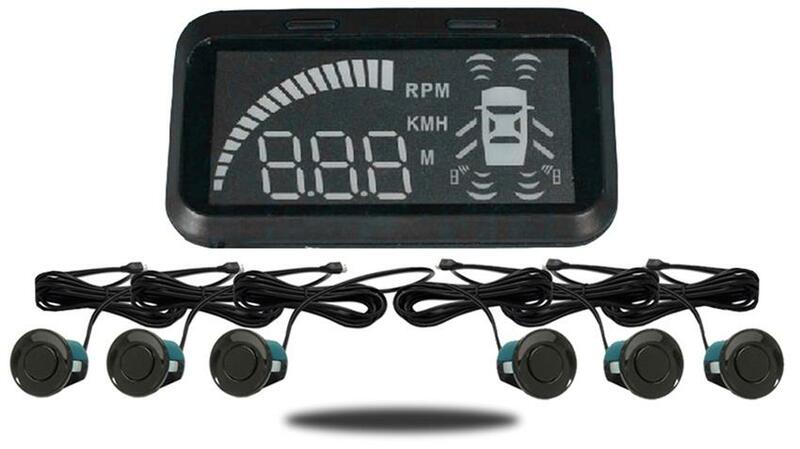 The TadiBrothers LED Car HUD is the best way to get fast and important information to the driver. Using this product your car will display a full range of new and exciting data. All that information is right there in front of you! For example, you can see your Speed and Fuel Consumption so you can save money by making sure that consumption is low. You can also set a Speed Limit Alarm to make sure you are not going over the speed limit and you are driving safe. The HUD does not need to be wired into anything for power. It is simply PLUG and PLAY. You just plug it into the OBD port and you are done. It is that simple, installation takes less than 10 seconds. Once it's plugged in just set it on the dash and you are ready to go. TadiBrothers as offers the best and brightest LED screens available so you can count on seeing everything clearly day or night. This is the most usable and the best Aftermarket Heads Up Display on the market. The LED Car HUD will reflect on your windshield to display a host of exciting information. From speed to fuel consumption you will see it all. This is the kind of feature that only the most advanced and luxurious cars offer. You can now see all the important things right in front of you. The TadiBrothers Head-Up Display projects relevant driving information directly into the driver’s line of sight. You can process the information faster than ever! It projects onto your windshield with an easy to read color image. The image is also displayed in a great position so it's simple to see while driving while not blocking your vision of the road. The installation is super easy and quick. Simply plug this into your OBD II port. As long as your vehicle was made after 1996 it is mandatory that your car has this port. So you know your car is compatible. Once you find the port, which is very easy to do, simply plug in the cable and you are done! All that is left to do is place the LED HUD on your dash and it will reflect onto your windshield. The installation can be done quickly and you will be enjoying the TadiBrothers LED HUD in a matter of minutes! For the Tire Pressure simply screw on the Tire Pressure Monitor cap onto the tire, this can be done with no tools and take no time. Just twist off the old caps and put on these caps and you are done! For installing the Sensors you need to drill into your bumper. You would drill in the front of your bumper and the rear bumper. This would allow the system to detect objects when parking as well as blind spots while driving. During parking, the system employs those sensors to detect nearby objects that might not be in your field of view, using Audible signals and illuminated displays to help you pull in. When the car approaches too close to an object in the detection zone, an alarm sound, increasing the intensity in proportion to the distance from the object. There are also SIX stages to the alarm as you near an object. The system begins to emit audio at 8 feet. Unlike other Car HUD systems, ours have sensors that go into your bumper to make the HUD even more effective and relay even more information to the driver. Some of these systems have more sensors than others. "ordered this and was sent quick thanks for that effort "
"We installed (professionally at a shop) these sensors on my father-in-law's Pontiac. They look and work great. Tadi's customer service is terrific. Very quick response to questions and no problems. "